Spider-Man: Far from Home to Introduce Classic Villain Molten Man? A majority of the development and production for next year's Spider-Man: Far from Home has been kept absolutely quiet at Sony Pictures and Marvel Studios, but that hasn't stopped a few leaks and rumors from slipping through the locks. The latest rumor claims that one of Spider-Man's most obscure villains Molten Man will make an appearance in the movie. Molten Man isn't the only villain rumored to appear in the movie. Jake Gyllenhaal has been strongly rumored to appear as the main villain of the movie, Mysterio, and Michael Keaton is confirmed to reprise his role as Adrian Toomes / the Vulture. Recently, other side villains have also been rumored to appear, including Chameleon and Hydro-Man. There's also still a good chance that Scorpion will appear in the movie, after he was teased during the credits of last year's Spider-Man: Homecoming. If Molten Man does appear in the movie, he will likely be joining an already crowded ensemble of villains. Because of this, he will more than likely be a cronie-like villain, similar to the two Shockers in Spider-Man: Homecoming. In the comics, Molten Man gained his abilities from a meteor that made his skin metallic, giving him super strength and, as his name suggests, fire abilities. However, the movie version of the villain will more than likely be tech-based rather than having cosmic abilities, much like Shocker and Vulture in Spider-Man: Homecoming. 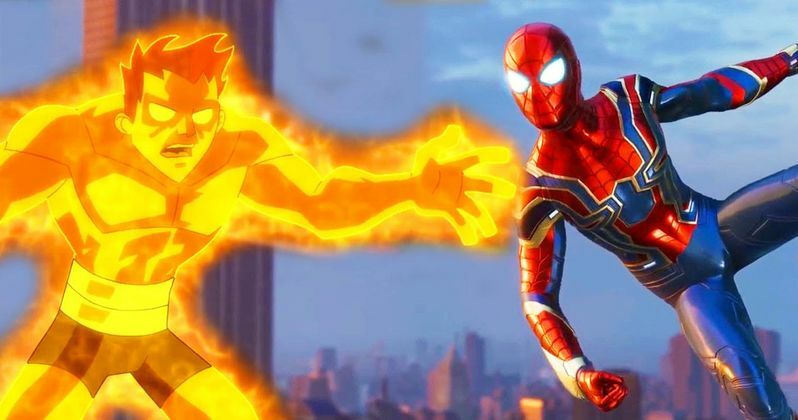 The rumor of Molten Man's inclusion in Spider-Man: Far From Home comes from a report that the villain will be included in one of the movie's LEGO sets. Historically, LEGO often gets all of the spoiler-ific details of upcoming movies about a year in advance in order to put out the best product a month or two before the movie releases. This wouldn't be the first time that LEGO has spoiled a Marvel movie. Even parts of Avengers: Infinity War were partially spoiled by LEGO sets, including the fact that Bruce Banner would be helming the Hulkbuster and that Thor would be forging Stormbreaker. Most of Spider-Man: Far From Home has been kept under wraps, considering that Marvel doesn't want to spoil too much about the future of his character. Spider-Man was one of the many heroes who quite literally bit the dust at the end of Avengers: Infinity War, so the fact that the web-slinger is getting a sequel is already enough of a spoiler. Revealing anything else about the future of his character could seriously impact how Marvel fans go into next year's Avengers 4. Considering that Spider-Man: Far From Home is already two months into production, it's honestly surprising that we haven't seen more reports and rumors come through. This rumor about Molten Man, reported by MCU Cosmic, certainly gives us a glimpse as to what we can expect from the movie. If Mysterio is indeed the villain of the movie, it would appear as though he is assembling a super villain army, and Molten Man may be part of the roster. We will know for sure when Spider-Man: Far From Home releases in theaters on July 5th, 2019.